Hope, Aspiration, and "American Dream Stuff": An Interview with Christopher DeWan. By Chuck Augello, Cease, Cows. "Flash is a Special Kind of Magic." 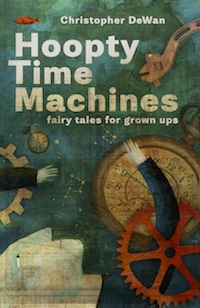 A Chat With Christopher DeWan, Author of Hoopty Time Machines. By Brianne Kohl, The Review Review. Of Wonder and Shadows: An Interview with Christopher DeWan, author of Hoopty Time Machines. By Steph Post. Flash Fiction and Happy Accidents. By LitWrap. What Can We Steal From Christopher DeWan's "The Atheist of Dekalb Street"? By Great Writers Steal.